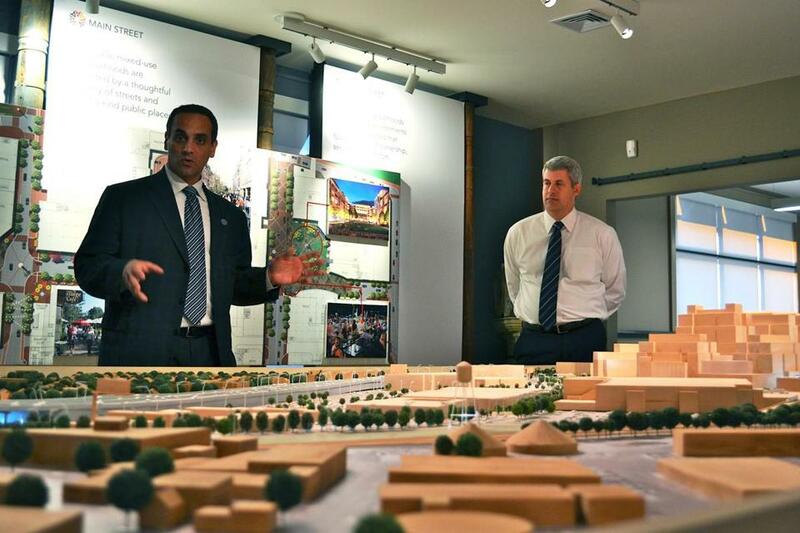 Mayor Joseph Curtatone of Somerville went over the Assembly Square layout with Don Briggs, a Federal Realty senior vice president. The steel beams of one structure can be seen from Interstate 93 and the foundation of another has been poured. The development of Assembly Square in Somerville is becoming a reality. Work has begun on two of four buildings expected to be completed in 2014 as part of the first phase of Assembly Row, a massive mixed-use development site that, when completed, is expected to include more than 800,000 square feet of retail space, about 1.75 million square feet of offices, and more than 2,000 apartments. Maryland-based Federal Realty Investment Trust owns nearly half of the developable land in the 145-acre area east of I-93 along the Mystic River that makes up the Assembly Square neighborhood district. It’s named for the former site of a Ford Motor Co. assembly plant, which offered hundreds of local jobs when it operated from 1926 to 1958. While the area was home to several other large businesses, most were shuttered by the late ’70s, and Somerville since then has sought to revive it. The plan is finally in motion. The first phase of Assembly Row includes four buildings that will hold about 450 apartments, an AMC movie theater, and 330,000 square feet of retail space, enough for 50 to 60 stores and restaurants, said Don Briggs, the Federal’s senior vice president of development. 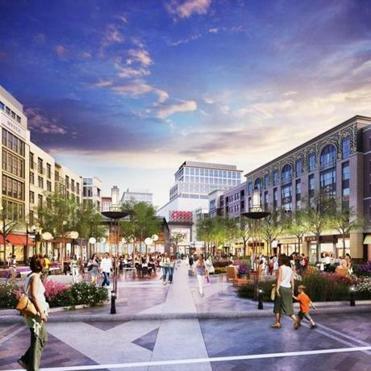 How the mixed-use residential and retail project is scheduled to grow in the next two years. The apartment buildings, AVA Somerville and Avalon at Assembly Row, are expected to begin to fill in the summer of 2013. Retail spaces will open over the course of 2014, Briggs said. The first phase also includes a 6-acre park along the banks of the Mystic River that is expected to open next summer. The first Assembly Row tenant opened for business in November, when Burger Dive began serving food in a small building near the future entrance of the development. An artistic rendering of the finished project, complete with a movie theater. AvalonBay Communities , Briggs said. Federal sees Boston’s high-tech industry poised for growth; companies in Cambridge and Boston are ready to branch out, and they don’t want to go far. Wig Zamore, a local community activist who often serves as a spokesman for the Somerville Transportation Equity Partnership, said creating an “upper-story” base of research and development jobs, which, in turn, creates a “lower-story” job base, is the key to the long-term success of Assembly Square. “If the city and the developers are able to make progress with landing a long-term stream of research and development connected with the research universities in Boston, then it will play out extremely well with the community of Somerville,” Zamore said. Legal C Bar, owned by Legal Sea Foods, and Papagayo Mexican Kitchen have signed leases in Assembly Row, and a wave of retailers claiming space is expected to be announced early next year, Briggs said. In the next phase, Federal Realty has its sights set on four more buildings, expected to be a combination of hotel, office, and retail, Briggs said, but those plans remain fluid and will depend on future partnerships. Federal Realty announced early this month its plans to purchase a 12-acre adjacent parcel owned by Swedish furniture company Ikea, which announced in July it had decided against opening a store on the site. It will be developed into a grocery store and two other mixed-use buildings. 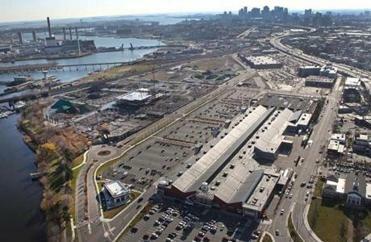 A recent view of the Assembly Row space in Somerville. Curtatone, an opponent of casinos, has ruled out any such development on the property, but he views a soccer stadium to host the Robert Kraft-owned New England Revolution as a possibility. But a stadium would have to be built on the remaining parcels not owned by Federal Realty, which doesn’t see pro soccer in its development plans. “I don’t think it fits,” Briggs said. About $130 million in public funds and more than $1.5 billion in private money has been invested in the Assembly Square area, according to Curtatone. Somerville’s assessment office estimates about $2.3 million in tax revenue from three-quarters of the land owned by Federal Realty will come in 2015, plus about $950,000 in state taxes and $5 million in one-time fees. Curtatone said the development is expected to bring in $17 million in tax revenue when finished. “And that number will go up,” he said. Alderman at Large Bill White said Assembly Square’s value to the city is the growth in tax revenue from businesses. “I think the key for the city is to have more commercial development for Assembly Square as opposed to residential development,” he said. “Commercial properties pay a higher tax rate and Somerville has a small commercial tax base. That would shift the tax burden off of residential homeowners. Included in the public investment is $29 million to build a new stop on the MBTA’s Orange Line next to Assembly Row, expected to open in 2014. Work crews will spend most of next year building the station’s structure and station systems, including electrical, plumbing, and wiring, MBTA spokesman Joseph Pesaturo said. “There will be more traffic but the Orange Line stop and walking and biking can cut the traffic in half,” said Zamore. The original plans projected 100,000 car trips a day to the site, but the new plans indicate only 50,000, he said. The new Orange Line station will be the conduit, White said. “I think once the T stop is complete, it will make Assembly Square a much more attractive site for offices and research and development,” he said. Globe correspondent Liam O’Kennedy contributed to this story. Jarret Bencks can be reached at Bencks.Globe­@gmail.com.